[MUSIC PLAYING] KERRY HOWELL: Welcome, and thanks for joining us today. My name's Kerry Howell. I work for Cornell University Wellness program, and I'm going to be joined in just a few seconds with my colleague, TJ Massaro. We're both exercise physiologists, and we're going to run through six different strength training exercises that focus on your core and can be utilized to help prevent low back pain. So let's get started. So our first exercise that we're going to show you is called the Bird Dog. For this, TJ is going to lower himself onto the mat. He's going to feel pressure in his palms and both of his knees, and the main thing to focus on for this exercise is keeping an engaged core, which means engaging your back and contracting through the abdominal area. And noticed the straight line through the crown of his head and right through along the spinal area. You're going to maintain that through the entire exercise. So we're going to do five repetitions, alternating from right to left side and the opposing legs. Go ahead, TJ, you're going to extend the right arm and the left leg, and then hold that for about five seconds, returning then to the start position. And then extending the left arm and right leg and holding that for about five seconds and returning back to start. So he'll go through this cycle another four times, extending, fully extending, reaching with the legs. And again notice the bent foot position with the full extension, straight leg. Also notice the full extension right through the finger tips for the arm. Return to start and extend, very good. Focus again on maintaining that straight line through the whole midline of the body. That's really where the work of this exercise comes from is maintaining that solid core as you're extending your leg and your arm. Very good. One last cycle of this. 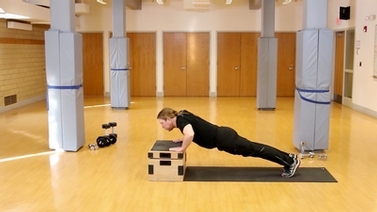 This exercise can be done with minimal space, as you can see, and just a mat. So you can do this at home, in your office, or in a fitness center. We're going to show you the Cat and Cow exercise. TJ, go ahead and get down on the mat for this exercise. You're going to start with having the arms and hands directly below your shoulders, and for your leg position, knees directly below the hip area. You're going to maintain both the arm and the leg position throughout this entire exercise. This is called the cat and cow exercise, because we start by gently arching the back up, like a scared cat. And we pause at the top of this and then slowly drop the back down and sag the abdomen towards the mat, like a cow. I'm going to have you have you repeat this nice, gentle raising up and then lowering for a total of five times. And back up, very good, and then back down. This is a great exercise to start any core strengthening program with. It increases that flexibility in the spinal area. It warms up the area for additional work to come. Very good, notice that nice control, sagging motion, and the last one, arching back up, and then a nice, gentle lowering back down, and returning to the middle position. Next, we're going to show you the McGill Curl-Up. TJ, go ahead and lower onto the mat, nice and slow. For the curl-up, one knee is going to remain bent the entire time. The other leg is going to be fully extended, with toes pointing up towards the ceiling. We're going to provide some extra support during this exercise by placing both hands underneath the low back or the small of the back. You can have the hands either stacked on top of each other, interlaced, or fingertips touching. Whatever is most comfortable and will provide the best support for you and your lower back during this exercise. TJ's going to do five crunches for us, raising the shoulder blades off of the mat and maintaining that contraction. You'll feel this all down through the abdominal area, and he'll hold it for about five seconds for each of these repetitions. Notice that you can assist yourself and push through that elbow area during this exercise and maintain that contact. So he's demonstrated this for the first three of the repetitions. If you want to bring this up to a more intense level for the next two, he's going to show the elbows off of the mat and hold. Maintaining the width in between the chest and the chin, keep that space, contract through the abdominal area, and bring it back to rest. We're going to show you a side plank and three variations of the Side Plank. TJ is starting in the seated position. He's going to transition into a Side Plank position, with the elbow directly underneath the shoulder. This is very important for this Side Plank. Notice that the knees are stacked, one on top of the other, and also notice that the ankles are touching as well and stacked. TJ, go ahead and raise up in towards my hand, very good, and hold this position. Again, that spinal alignment, like an arrow going straight through the crown of the head and straight down through, is very important. He's going to hold this for about 10 seconds. Keep on breathing throughout this whole time, nice even breaths, and then lower back down to the mat. This is one of the three variations that we will show you. We're progressively going to make them more difficult. You pick which variation works for you. The next variation we're going to do is a Straight Leg Plank. Notice that the ankles again are stacked, knees are stacked, and again, take very close note that the shoulder is directly over where the elbow position is, again very important. TJ, go ahead and raise, push the hips up off the mat, maintain that straight line, straight down through here. For most people to maintain a straight line, you may need to gently push the hips slightly forward from where you feel like you're in a straight line. And hold that for a few seconds, very good, maintaining that position. Excellent, lower back down into the mat, and we're going to show you a third variation of this. This is the most difficult and challenging. So it's called a Star. Start out with the ankles, knees stacked, and again that same shoulder position. TJ, raise up, hips off of the mat, push the hips slightly forward. And then he's going to raise both the straight arm and straight leg directly up, and holding this for a total of about 10 seconds. Notice that the feet are both flexed. Very good, and lower both back down into the mat. This exercise is called the Dead Bug exercise. Notice that TJ is starting by laying on the mat. He's going to raise both knees up simultaneously, maintaining a contraction through his abdominal area and maintaining that natural curve of the low back area, throughout this whole exercise. While he's maintaining the legs up in this position, he's going to add the arms, fully extended as well. This is considered the start of this exercise. From this position, he's going to lower his right arm and left leg simultaneously, in fully extended positions, down towards the ground, without actually touching the ground, and then bring them back up to our start position. Now he's going to pause and then extend the right leg and left arm, and hold that for about five seconds, and then return that back to the start position. He's going to repeat this cycle five times on each side. Very good. Back, excellent. You're going to feel this really engaging the entire abdominal area. Notice as he extends the leg, there's still space between the heel and the ground. Same thing with the hands. There's still a little space. 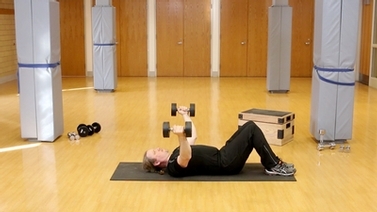 That keeps constant tension on the abdominal area and the low back area during this exercise. Last repetitions for each side, continue to keep slow and controlled breaths, and maintain that natural curvature of the spine. This exercise is a Hip Bridge exercise. We're going to show you three variations. They'll progress in intensity level as we go through the exercises. Pick the one that's the correct level for you to start with. Notice that TJ is beginning this exercise in the laying down on the mat position, with the heels just in front of the midline of the knee cap. That's a good start position for this. We're going to be driving the hips up towards the ceiling for this exercise and then holding it for five seconds. Hands can be placed on the chest or beside the body on the mat. This is very intensive on the hamstring area and on the glutes and the low back. Try to engage the glutes or contract the glutes before beginning the hip drive, and holding out for five and lowering back down. There's a first level of the exercise. We're going to show you the second level of it, or second variation. You start with that hip drive, and then when you're in this position, you're going to raise a knee towards your chest and hold that for five seconds. And then lower back down and lower the hips back down to the mat. That would be considered one repetition of that exercise. Yep, for five, and back down, and he'll show this one more time. Hip's up, draw the knee towards the chest, hold for five, and resume the start position. The last and most intense variation we will show you is with the leg being fully extended. Drive the hips up, extend the leg straight out, hold for five, return and lower back down. Another tip for you is as you extend the leg out straight, notice that the other leg and heel are driving in and maintaining that pressure on the mat. Last time, and hold two, one, and lower back down. TJ and Kerry here to offer you two tips that can help you while you're going through the course strengthening exercises. Tip number one, when you're going through and doing the Cat and Cow exercise, where you're repeatedly arching and then lowering your spine, you want to make sure that you're just doing a nice, gentle continuous motion, rather than trying to push the extremes of either the arch or the lowering. Tip number two, TJ is going to help with that. TJ MASSARO: So what you can do here is use your foam roller to help relieve some muscle tension in your hip flexors and hip rotators. So first, we'll start with the hip rotators. You want to sit on your roller. You're going to get a hand behind you for support and lean to one side. You're going to roll slowly back and forth across the muscle, finding uncomfortable spots. Once you find an uncomfortable spot, you can stay there, hold that for a few seconds, until that releases. The next step you can do for the hip flexors, place your roller on the outside part of your hip. Lay down, with your elbows underneath for support, and same thing. Roll across that area, again, pausing on uncomfortable spots. You can also get to the outer part of the hip for those same areas. KERRY HOWELL: And TJ, if that isn't quite enough for a person to feel that and help to get that muscle to relax, what's your suggestion? TJ MASSARO: I would use either a tennis ball, or what we have here is a lacrosse ball, which is going to intensify that just a little bit more. KERRY HOWELL: Thanks for listening to our tips today. Enjoy your core strengthening exercises. Performing a few exercises a couple of times per week that strengthen your core can have a positive impact on all parts of your life. A strong core can improve performance for weekend warriors, contribute to better posture, and help to prevent low back pain flare-ups. Using your own body weight, Kerry and TJ, exercise physiologists from Cornell Wellness, will lead you through 6 exercises that only require yourself and a comfortable floor mat. Thorough demonstrations for each exercise, including a few variations, and a helpful tips section, are included. This exercise routine consists of: Cat/Cow Stretch, Birddog, McGill Curl-Up, Side Plank, Hip Bridge, and Deadbug.